Last year, ISIS forces destroyed a number of ancient buildings in the Syrian city of Palmyra, doing irreparable damage. But one piece of Palmyra’s past is getting something of a second act—with the help of 3D printing. Palmyra’s landmark arch, referred to by many as the Monumental Arch or the Triumphal Arch, was one of many of the Syrian city’s ancient structures that were destroyed by ISIS in 2015. But this week in London’s Trafalgar Square, the Institute for Digital Archaeology unveiled a two-thirds-scale reproduction of the arch, as part of World Heritage Week. The reproduction was carved from stone by a mechanical arm, based on 3D photography of the original—essentially, heavy-duty 3D printing. Italy-based TorArt was responsible for the creation of the piece. The original arch was built by the Romans nearly 2,000 years ago. The IDA, based in the U.K. and U.S., is using the help of volunteers to capture images of important sites, using 3D cameras supplied by the Institute. The focus, according to the IDA, is on sites that are at risk for destruction. Upon the database’s official public launch, visitors to its website will be able to explore world heritage sites in three dimensions online. Palmyra’s Monumental Arch stood between the Collonade and the Temple of Bel, also destroyed last year by ISIS. The Institute's plans for the future include on-site reconstructions of heritage sites that have been destroyed. 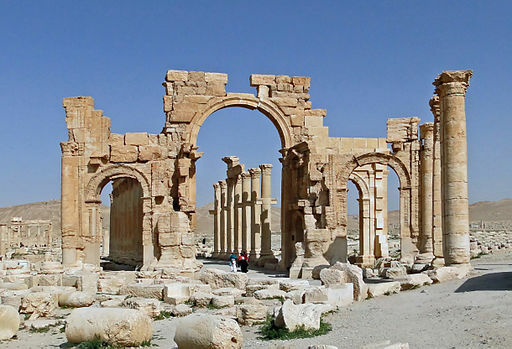 It told the BBC that the arch will be on display in various cities worldwide before, according to the group’s plans, it will be installed in Palmyra.